It is highly recommended that you inspect the covers before beginning the installation. My driver’s side seat back had uneven stitching across the lumbar area. I emailed photos to leatherseats.com and they sent out the new seat back right away. The rear seat bottom is really easy, just push the seat towards the rear of the car about 1/4 of the way across the front of the seat and pull up. The seat bottom will pop up, repeat on the other side and you can remove the seat bottom. The front seats also come out easily. Slide the seats all the way forward and you'll see plastic covers over the rails on either side of the floor. Remove the little plastic pieces covering the screws (one per rail), then remove the screw and the covers come off. Now slide the seat all the way back and you should see two T45 Torx bolts in the bracket at the front center of the seat near the floor. Remove the two T45 Torx bolts in the front center of the seat where it attaches to the floor (This may be different on a V6 Passat). Slide the seat back and it will come right out of the rails. Lean the seat back so you can see the bottom of it. Underneath you will see where the harness for your seat belt/seat heater/etc. plugs in. Unplug it and move the harness out of the way. I found it easiest to remove the front seats through the back doors. Just tilt the seats back, lift with one hand on the front of the seat bottom and the other at the top of the seat back. Be careful not to scratch the interior trim with any sharp areas on the bottom of the seat as you pull it out. Up to this point I have spent about 20 minutes on the project. Once you have the seats out you are ready to begin the installation. I did the rear seat bottom first. Once you flip over the seat the hog rings will be obvious all the way around the seat bottom. Use your pliers and remove all of the hog rings you can see. I used a twisting motion to remove the hog rings. The seat bottom is almost all the way off. Now around the middle of each seating area VW uses 4 metal rods to keep the cover in place. Pull back the cover and you will see the rods, they just hook over part of the seat frame. One hog ring secures the middle of each long rod, remove it and unhook the ends of each rod to complete the removal of the cover. Try not to bend the ends of the rods too much because you will need them for your new leather seat cover. Remove the rods from your old seat cover and install them into the leather seat cover. Begin the reverse of removal for installation of the new cover (Don't forget to put new hog rings on the rods). Be aware of which direction you have the cover going on, it is possible to try and install it backwards). The hog rings are meant to go around the piping on the end of the new cover. Work the leather onto the seat bottom, trying to eliminate wrinkles. I put about six hog rings around the bottom of the seat which allowed me to work the wrinkles out by putting in more rings to pull the leather. Once you are satisfied with the results set aside the seat bottom and get to work on the rest of the interior. Start by removing the seat headrests, just push the button at the base of the head rest post and pull. Remove the plastic trim parts from around the bottom of the front seat. To accomplish this remove the philips screw from the front of the seat and pull down on the plastic. It is just shoved up into a space around the bottom of the seat. To remove the other plastic piece you need to remove the up/down ratchet lever. Remove the little plastic covers and use your Torx T25 screwdriver to remove the two screws. After that the handle comes off. Now remove the seat rake rotary knob. I just pulled mine off and subsequently damaged it. If someone knows how to remove it without damage I'd appreciate some advice. Also remove the lumbar rotary knob by pulling it out. The lumbar knob will not be damaged from pulling it out. After you remove the screw in front the last plastic piece should come off. Now remove the seat bottom cover, just work your way around the sides, front, and back of the seat pulling the cover out of it's groove. Once the cover is out the foam seat bottom should also come out. Use the recline feature on the seat to lean the seat all the way forward. At the bottom of the seatback you’ll find a seam. The seam uses the same plastic channels as the seat bottom. Start pulling from one end and you should be able to pull apart the bottom of the seat back. Now you can lift up the lumbar section of the seat. The side bolster cloth is attached to a metal rod by hog rings. The metal rod passes through a pocket on the side bolster much like the bottom of the rear seat. This metal rod is hooked to the seat frame at the ends. Pull back the foam at the top and the hooked end of the metal rod will be visible. Unhook the rod after removing the hog rings and the side bolster will come out. You can just remove the hooks and wait on removing the hog rings until later. 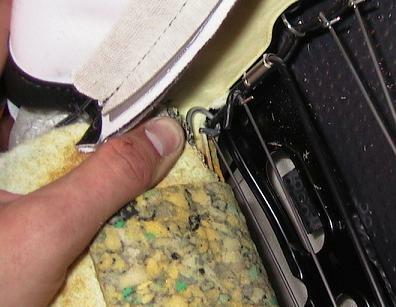 The center piece of cloth is attached to the lumbar support by a pocket at the bottom. To separate the cloth from the lumbar support pull it out of the pocket. It should be possible to remove the upper seat cloth from the seat frame. When the seat is completely stripped it will look like this photo. The side airbag is plainly visible in this shot (passenger seat). Inside the box of interior skins you will find two seat back pieces. At this point both seat backs are the same since no holes have been punched in the leather yet. Once again inspect the leather for flaws, you can hide some flaws by installing on one side or the other of the car. If there are flaws you can’t live with just call your leather supplier and have it replaced. Pull the new leather skin over the seat back. It might help if you lay the cover outside in the sun so the leather will be more pliable. Once the cover is slipped over the seat back install the metal rods and hog rings. This is where you need to pay attention to fitment. By pulling the leather with the hog rings you can work out the wrinkles. Don’t worry if you get a hog ring in the wrong spot, the holes will be behind the center lumbar piece. Some of the wrinkles will relax out of the leather after some time. In the first photo at the beginning of this article the leather looks fairly wrinkled. In the photo to the left the leather had been installed for a couple of weeks. Using your favorite leather care products will help work some of the wrinkles out of the seats. To cut the holes for your headrest posts install the seat back leather and make sure it is on the seat correctly. The leather needs to be in place to get the holes in the correct spot, basically in the center (front to back) of the upper piece. Feel for the holes in the center of the post receivers and cut a cross in the middle. Then pull the leather around the post. Use a dull flat blade screwdriver or similar tool and tuck the leather in around the post. The control for the lumbar support is cut out in the same way. Feel for the control on the outside of the seat and cut a cross to pull the control through. Install your lumbar handle and your upper seat back is almost finished. The lumbar support section is installed much like the OEM seat. Tuck the lumbar support into the pocket on the new seat back. Instead of the plastic channel material my leather seats had zippers along the bottom of the seat back. 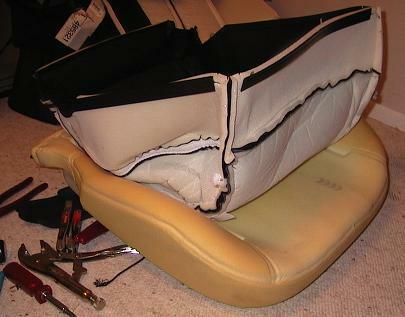 Push the lumbar section down so it meets up with the bottom of the seat back, attach the zipper and you are almost finished. The ends of the zipper are about one inch longer than the seat back itself, tuck these back into the bottom of the seat back. The front seat bottom installation is exactly like the rear seat. The four rods and hog rings attach the center of the leather cover to the seat bottom. In the bottom photo I have installed the leather seat cover and it is ready to go back on the seat frame. One suggestion on installing the seat bottom is to use some spray adhesive on the backside of the two center panels. This will secure the panels to the foam seat, after installation on my car the center of the front seats stuck up like a tent. I removed the seat bottom and glued the center section down. After more than a year of use the seat bottom still looks great! Take your seat bottom and reattach it to the frame, the same type of plastic channels are used to attach the seat bottom. 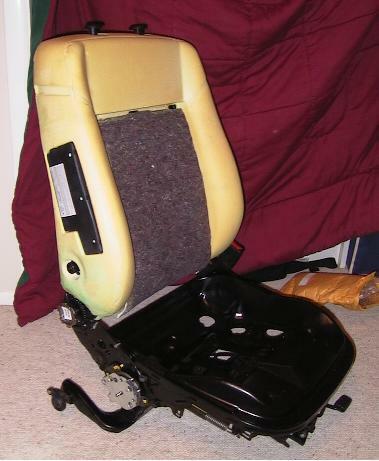 Reattach the seat controls and reinstall your newly completed seat. Once you have the seats installed I suggest using a product like Lexol to condition the leather. 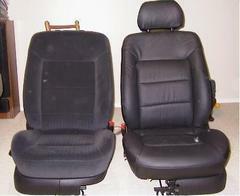 It will extend the life of your leather interior and help reduce the wrinkles from shipping. Compare the seats in the photo to the above to the first picture in this write up. The photo to the left is after the seats have been installed for a month and treated with a leather conditioner. 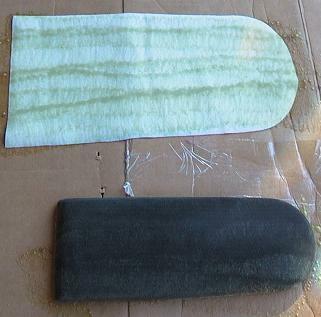 The shipping wrinkles are normal and will come out if you use the leather conditioner. The rear seat backs are a 60/40 split on all Passats except 4Motion cars (which are fixed in position). 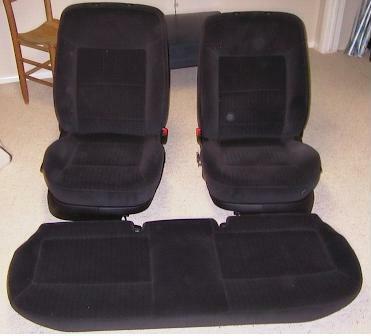 The 1998 Passat has two headrests and a center arm rest while the 1999 Passat has no center arm rest but three head rests. The early 1999 Passats have three identical headrests while the later models have a smaller center headrest. 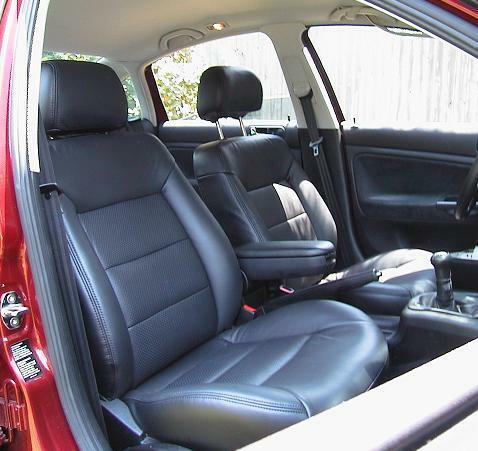 The 2000 and later Passats have three headrests and a center arm rest. Because of all these variants it is important to check which seat back was sent in your kit before beginning installation. Begin by removing the rear headrests. The rear seat back attachment points will be plainly visible with the rear seat bottom removed from the car. Near the seat belt anchor point on the driver’s side is the hinge for the seat back. Two T45 bolts attach the hinge assembly to the seat back and the unibody of the car. The center seat belt is integrated into the frame of the larger seat back, the lower anchor for the seat belt is anchored to the unibody via a T45 bolt as well. The rear side bolsters are attached to the car by the strikers for the rear seat backs, a clip near their center, and a tongue/groove setup in the lower trim along the door sill. Begin by detaching the lower center seat belt anchor point. Using your T45 socket it should be fairly easy to remove the anchor. The seat hinge is next and with the hinge out each seat back should be individually removable. The seat backs have pins that slide into the unibody on either side, with the hinge removed carefully pull the seat forward and toward the middle of the car. At this point each seat back will come out quite easily. Start with the smaller of the two seat backs, on my Passat this was the driver’s side seat back. The cover fits into a groove all the way around the back of the seat. Pull the cover out of it’s groove, pull the fabric out from around the seat back release and headrest posts. 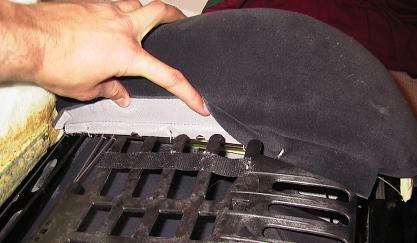 The seat back center is secured to the foam using the rods and hog rings. This next shot shows how I approximated the position of the holes in the top of the rear seat backs. I just placed the cloth seat cover over the installed leather one to give me an idea of where to cut. You can also feel the seat levers under the leather. Cut the square hole for the seat back release larger than required, you can stretch the leather around the release bezel. The larger passenger’s side rear seat back installation is similar to the driver’s side seat back. The main difference being that there are additional cuts for the center seatbelt and headrest (if so equipped). 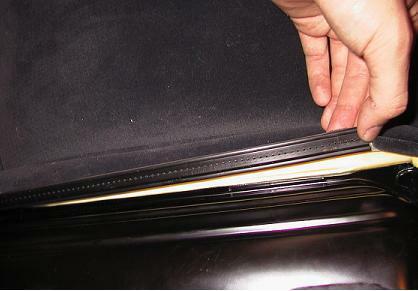 There may not be a pocket for the center vertical metal rod in your new seatback like the OEM seat cover. I went ahead and installed the interior without the center vertical rod. In hindsight I should have had a shop sew a pocket on the cover. I may remove my seat back again and have it sewn, I think it will smooth out the leather a little bit more. The headrest installation is different for the front and rear headrests. 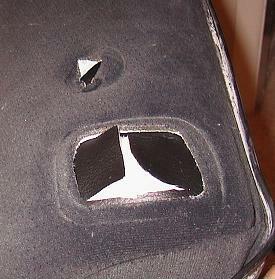 The front OEM headrests use a channel system to secure the fabric around the foam. With the headrests removed you will be able to see the seam at the bottom and should be able to pry it apart. The new headrest covers have a zipper at the bottom. Pull the cover over the headrest and zip it up. Tuck the ends of the zipper into the headrest and reinstall. The leather cover on my car was slightly big for my headrest. I guess it may be because the foam shrunk slightly over time. I think if you were to steam the foam a little bit it would return to it’s original size and fit the cover better. The leather on my car has tightened up over time. The rear headrests are press fit together. 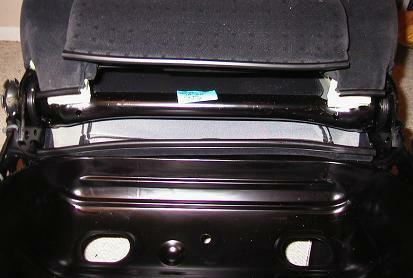 The rear side bolsters are located on the outboard sides of the rear seat backs. As I mentioned before the bolsters are held in place by the rear seat strikers and two clips. One clip hooks over a metal bracket about midway down the bolster and the other engages a hole on the door sill plastic. To remove the striker you will need an allen wrench and an 18mm box end wrench. Use the allen wrench to hold the striker while you remove the 18mm lock nut. Once the lock nut is loose unscrew the striker from the body. Remember that the depth of the striker is set by the lock nut so it is important to note where it is set before removal. With the striker removed pull up on the bolster gently. This will disengage the clip over the metal bracket. Push gently on the lower forward corner of the seat bolster and it will disengage from the door sill. The fabric is secured to the seat bolster by glue and staples. The staples are plainly visible on the back of the bolster. Take your new leather (it’s actually vynil) and set it in the sun for about an hour to make it more pliable. Lay the new piece over the bolster to get the positioning of the leather set. With the positioning figured out take your spray glue out. Spray the back side of the leather and the fabric seat bolster. Let them sit for at least five minutes before sticking them together. Work out and wrinkles in the bolster and without stretching the vynil begin stapling. If you stretch the vynil with the stapling you will end up debonding the leather and fabric. Now for the gluing project. I decided to start with my front center armrest since I'd think that is the cheapest piece of material to replace if I screw it up. 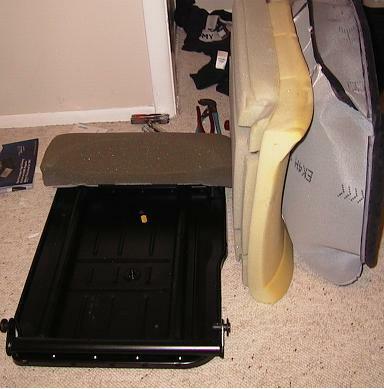 Remove the center armrest lid from the car by pulling it in on one side to pop it out of the bottom. Take a screwdriver and separate the plastic piece from the part that has the fabric on it, there are clips on the front and sides. In the rear the top engages a two slots on the back so once you have the front and sides pulled up slide the upper piece forward. Now you should have the two pieces of your lid. Look at the bottom of the lid and get an idea how the leather will go on based on what the factory did with the fabric. I test fit mine a couple of times before applying glue to make sure I knew how to end up without wrinkles. Following the instructions on the glue spray can I applied glue to both the leather piece and the lid, do not remove the fabric just spray glue on the fabric piece. Let them sit for about five minutes. Now place the lid in the middle of the piece of leather. I started stapling around one side, then the back, the other side, and finally the front. The photo to the right shows the nearly completed armrest cover. This shot is before I trimmed the leather back a bit. The cover will be pretty tight to reinstall but eventually it will go on. These pictures show the top of the completed cover. Not too bad if I say so myself! Cover with the other half installed. This is the one part of the install I would suggest taking to a professional. At most it would run about 150 dollars to have this done and would be worth every penny. I have attempted recovering the door panels four times using three different methods. On at least one door panel the leather stayed glued for a couple of weeks, after which it started lifting from the cloth door panel. I’ve finally resorted to buying some OEM door panels off of a wrecked Passat. You don’t even want to know how much it costs to buy new ones from the dealership.